This beautiful hand crafted wooden gun rack is the perfect way to display your favorite rifles. It is made of Beech, and is designed to hang on the wall and will add that special touch to your den or trophy room. The two drawers provide storage for shells and cleaning supplies. The shelf will accommodate additional accessories. 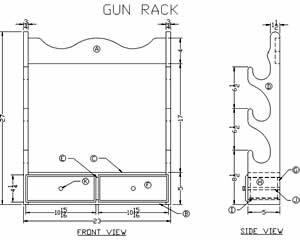 Keep your guns neatly organized by building your own wooden gun rack with the easy to follow instructions below. 3/4" x 4" x 21 1/2"
3/4" x 5" x 21 1/2"
3/4" x 5" x 27"
3/4" x 3 1/2" x 5"
3/4" x 4 1/4" x 10 15/16"
3/8" x 3 3/8" x 9 1/2"
3/8 " x 3 3/8" x 5"
1/8" x 9 3/4" x 4 1/2"
3/8" x 3/8" x 5"
Scale Top A to the drawing dimension size. This can be accomplished by measuring the print out of the project and dividing that size into the dimension size shown on the drawing, or listed in the Bill of Materials. This will give a “Multi-Factor” that can be used to figure the enlargement size for the pattern. Take the drawing printout and the multi-factor to a printing company. Most printing companies that do duplicating can make the enlargement required for the pattern. The same multi-factor can be used to determine the enlargements for the other shape D.
Trace the pattern enlargements onto poster board or Mylar and cut out the patterns with a pair of scissors. Use these patterns to trace the shapes onto the wood stock. Use a jointer to joint one edge of all lumber. Use a planer to plane all lumber to required thicknesses. Use a radial arm saw to cut all lumber to required lengths. Use a table saw to rip all lumber to required widths. Trace the pattern for top (A) and sides (D) onto the lumber and cut out the shapes with a band saw. Use a spindle sander to sand the shapes for top (A) and sides (D). On the inside of sides (D) measure 2 5/16" from the bottom of each side. Use a radial arm saw to cut dado joints for the drawer guides (J) 3/8" wide x 3/16" deep in each side. Measure 1 9/16" up from the bottom of the self support (E), and use a radial arm saw to cut dado joints for the drawer guides (J) 3/8" wide x 3/16" deep on both sides of the self support. On the outside of each drawer side (H) measure 1 1/2" up form the bottom of the drawer side, and use a table saw cut dado grooves 13/32" wide x 3/16" deep to accommodate the drawer guides. On the inside of the drawer fronts (F), cut 3/8" x 3/8" rabbet joints at the top, bottom and sides of each drawer. On the inside of drawer front (F), back (G), and sides (H), cut 1/8" x 1/8" deep dado joints 1/8" from the bottom edges of each side and back to accommodate the drawer bottoms. Route edges of drawer fronts (F) with a 5/8" Roman-Ogee Bit. Drill a 1/8" hole through the center face of each drawer front (F) to accommodate the screws for the drawer pulls (K). Also bevel the holes on the inside of the drawer fronts so that the flathead screws will fit flush. Rough sand all parts with an orbital sander and 80 grit sandpaper. Intermediate sand all parts with an orbital sander and 120 grit sandpaper. Rough and intermediate, sanding should be completed before assembly procedure. Finish sand all parts with an orbital sander and 220 grit sandpaper after the assembly procedure. Hand sand all edges, details, with 220 grit sandpaper just prior to the finish procedure. Measure 1" down from the top of sides (D). Apply wood glue on both ends of top (A) and align the top between the sides at the 1" marks. Also be sure the top is flush with the back of each side. Using a nail gun with 2" nails, secure the top to the sides. Glue and nail bottom (B) flush with the bottom of sides (D). Glue and nail shelf (C) 3 1/2" up from bottom (B). Note: Make sure that the shelf and the bottom are perfectly parallel. Glue and nail the shelf support (E) in place. Glue drawer guides (J) in the sides (D) and the self support (E). Position the drawer bottom (I) in the dado grooves of the drawer front (F), drawer back (G), and the drawer sides (H). Glue and nail drawer together with 1" nails. Repeat procedure for the other drawer. Attach drawer pulls (K). Note: Drawer pulls should be attached after the finish procedure. Apply wax on the drawer guides (J) and in the dado grooves of the drawer sides (H). This will allow the drawers to slide more freely. Place drawers in the gun rack assembly. Use plastic wood dough to fill all holes, cracks and imperfections. Hand sand all edges with 220 grit sandpaper. If stain is desired, apply with a brush and allow to dry penetrate for 5-10 minutes, then remove with a clean rag. Allow stain to dry 6 hours and then repeat with a second coat. Apply a clear finish coat such as Varathane, Polyurethane, etc. using a pure-bristle brush. Allow to dry 12 hours. Lightly hand sand finish with 220 grit sandpaper. Apply second coat of clear finish. If third or fourth coats are desired, be sure to allow the finish to dry properly then lightly hand sand with 220 grit sandpaper between coats. Allow final coat to dry 24 hours before using your wooden gun rack. 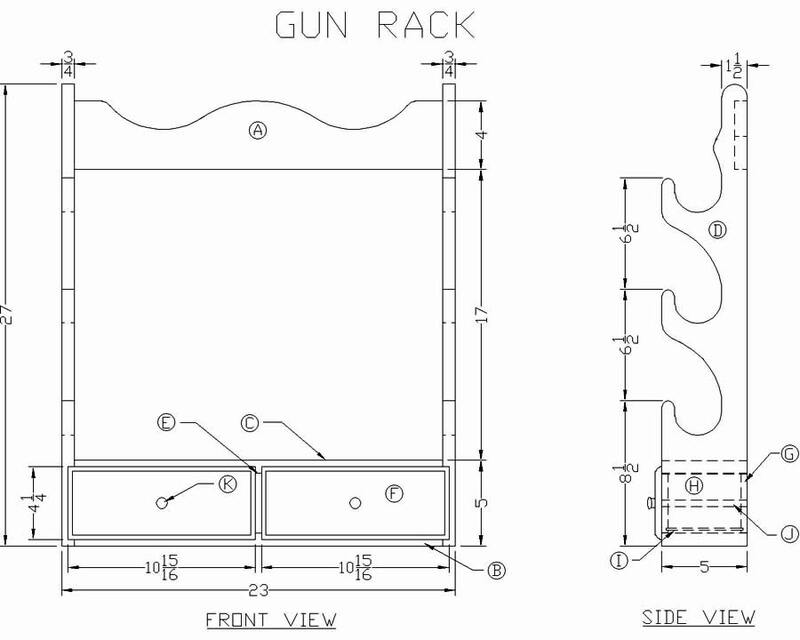 Congratulations, your wooden gun rack is finished and ready to display your rifles.